No matter where you live, no matter the weather, there is one home comfort system that you’ll absolutely need to work in your home—your water heater! It’s easy to take this system for granted, and the fact that it will supply you with hot water whenever you need it. When you consider the level of stress your water heater undergoes, however (it works 365 days a year!) you’ll understand that it can’t operate 100% free from problems. At one point or another, you’ll likely need to have your water heater professionally repaired, or potentially even replaced. It helps to know the warning signs that something is amiss with your water heater. Keep reading to learn about some of these indicators. Have you noticed people in your home complaining about going with cool or lukewarm water in their showers in the morning? If this just recently started happening while you use to have sufficient hot water for everyone in the morning, it means your water heater is probably losing heating power. 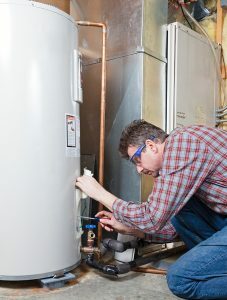 This is one of the most common signs that your water heater is in trouble. If you turn on any of your hot water taps and see rusty, brownish discoloration in your water (similar to what you might see when you turn on the faucets after a long vacation) it usually means that there is too much sediments inside the hot water tank. It may also indicate corrosion, which is a much more serious problem that we’ll get to in a moment. This noise coming from your water heater can certainly be alarming—is your water heater tank about to burst? Probably not—however the noise still isn’t normal and definitely isn’t something you want to hear coming from your water heater. It may mean an increase in water pressure within the tank, sediment among the bottom of the tank, a broken expansion tank, or cold and hot water mixing at the top of the tank due to a broken dip tube. The best thing you can do is to call in a pro to take a look. You never want to see water escaping from your water heater or pooling around the base of the water heater. The only place you should ever see water dripping from with your water heater is the pressure relief valve. Water dripping from anywhere else is a serious issue that needs to be remedied before the leak becomes worse. Water heaters with a tank system are designed to resist corrosion for most of their service life (so long as they receive routine maintenance once a year). If corrosion starts to appear on the water heater, it can sometimes be solved by replacing the corroded portion, like the heat exchanger. But more often than not, corrosion is a sign that it’s time to replace your water heater altogether. IERNA’s Heating & Cooling is your trusted resource for Tampa water heater services and more. Contact us today!